Since starting this blog I have been contacted by readers many times with questions about couponing, Frugal Living, Walmart’s policies and procedures, and various other little things. I figure if one person is wondering about it, there might be others so this will be an on-going feature to answer the most common questions that come up. If you have a question, please check out the master list of Ask A Walmart Expert articles to see if your answer is there already or contact me and I’ll do what I can to help you out. I’ve talked a little about this in the past but I think it would be helpful to make tin info a little more accessible to all of us. 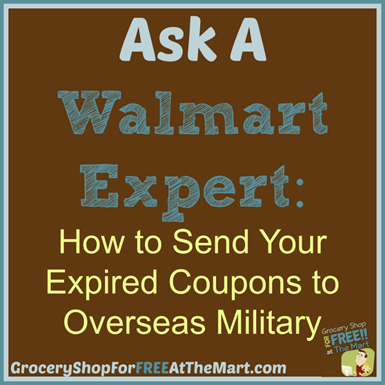 Every month you can send all your expired coupons to our overseas military where they can use coupons up to 6 months past their expiration dates. 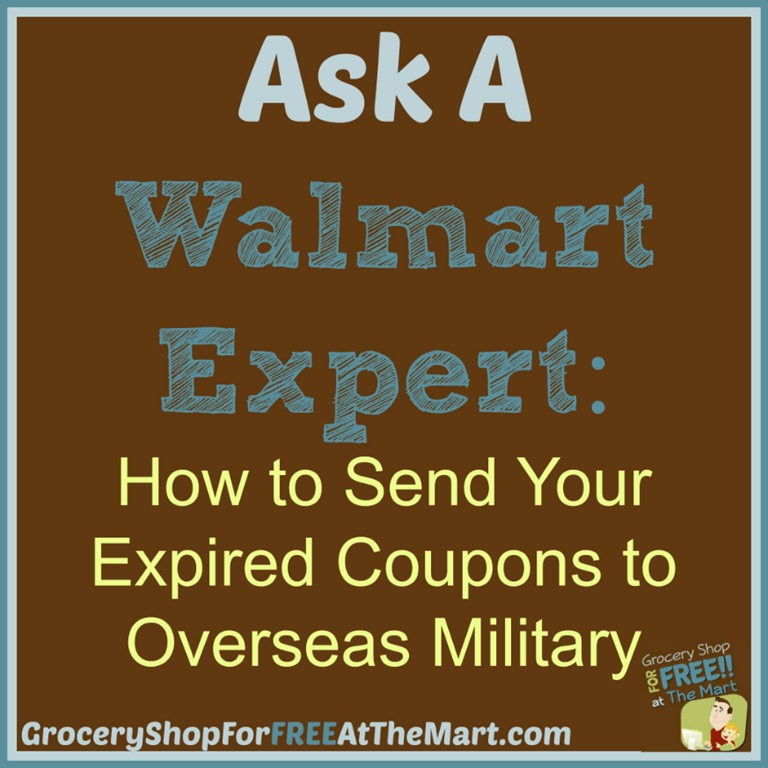 Money gets stretched this when you are living off one income and are away from your extended families so it is incredibly important that our military families get these coupons so they can make their dollars go as far as they can. How do I sort the coupons? If you have the time, you can sort your coupons into food and non-food baggies. However, in the past when I’ve said that, I’ve gotten some push-back from people who say they don’t have the time to sort. The important thing here is that the coupons get sent. If you clip all your coupons and it’s no big deal to throw them in 2 different piles. sort them. If you keep your inserts whole except for what you clip, don’t sort them if you don’t have the time. Just be sure to send them out. The one advantage to clipping coupons instead of sending whole inserts is your postage will be cheaper. Also keep in mind that you don’t need to send printable coupons, they already have access to those. Can I Select Where My Coupons Go? Actually yes! This is a program I didn’t know about until recently when a reader forwarded me a link. You can Adopt a Base by clicking here. Where do I Send My Coupons? Here is a list of addresses you can send them to. How Do I Know What Coupon Inserts are Expired? I have 2 handy tools that will help you with that. You can see a running list of expired Coupon Inserts here. You can also look up each insert and see when all the coupons in it expire.